Bayesian view on Neural Networks! How Chrome can still freeze even on a nigh-supercomputer! A tour inside a chip that does Floating Point calcs! I have trouble resisting a good performance mystery but in this case the draw was particularly strong. I work at Google, making Chrome, for Windows, focused on performance. Investigating this hang was actually my job. And after a lot of false starts and some hard work I figured out how Chrome, gmail, Windows, and our IT department were working together to prevent me from typing an email, and in the process I found a way to save a significant amount of memory for some web pages in Chrome. This investigation had so many rabbit holes that I’m going to save some of the digressions for a follow-on post (which is here) , but this one will entirely explain the hangs. As usual I had UIforETW running in the background, tracing to circular buffers, so I just had to type Ctrl+Win+R and the buffers, representing the last thirty seconds or so of system activity, were saved to disk. 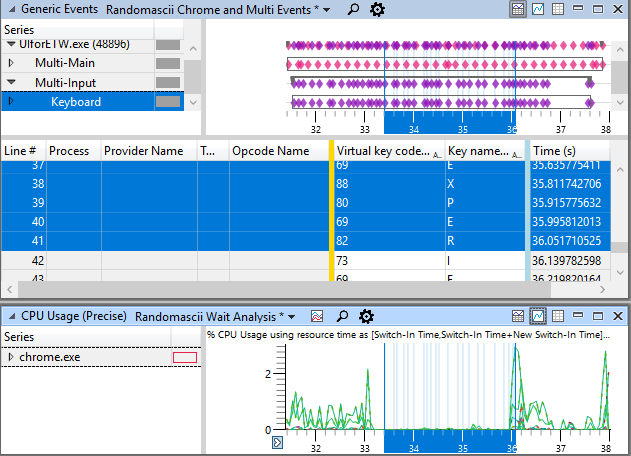 I loaded it into Windows Performance Analyzer (WPA), but I couldn’t definitively find the hang. Was typing “defer to those with more scuba experience” and gmail hung around the end of “those” and then resumed partway through “experience”. gmail tab was PID 27368. Okay, but why is Chrome stopping? Here’s some foreshadowing: not shown in these screenshots is that WmiPrvSE.exe was consuming an entire CPU hyperthread whenever this happened. But that shouldn’t matter. I have a 24-core/48-thread machine so consuming one hyperthread means my machine is still about 98% idle. I then zoomed in to the clearly-significant period where Chrome was idle and looked in particular at CrRendererMain in chrome.exe (27368), the gmail tab process. Aside: I just want to say thank you to 2015 me for asking Microsoft to improve their thread naming mechanisms, and thank you to Microsoft for doing everything I suggested – thread names in WPA are great! Chrome is calling VirtualAlloc, which tries to update some “CfgBits” and needs to acquire a lock. At first I assumed that Chrome was calling VirtualAlloc 440 times, which seemed like a weird thing to do, but the reality was perhaps weirder. Chrome called VirtualAlloc once and a lock needed to be acquired. Chrome was signaled when that lock was available but – for 439 times in a row – when Chrome woke up and tried to acquire the lock it was unavailable. The lock had been reacquired by the process that had just released it. This is because many Windows locks are, by design, not fair and if a thread releases a lock and then tries to reacquire it immediately then it can, in cases like this, reacquire it every single time. Starvation. More on this next time. It turns out that reproducing the slow scanning from the sampling data was quite easy. The interesting part of the call stack above is NtQueryVirtualMemory, which is used to scan process memory, and is called by the suggestively named GetProcessVaData, where Va probably stands for Virtual Address. My VirtualScan program just called NtQueryVirtualMemory in the obvious loop to scan the address space of a specified process, the code worked, it took a really long time to scan the gmail process (10-15 seconds), and it triggered the hang. But why? The advantage of writing the scanning loop myself was that I could start generating statistics. NtQueryVirtualMemory returns data on each contiguous range of address space that has matching attributes. That might mean all reserved, all committed with particular protection settings, etc. The gmail process had about 26,000 of these blocks but I found another process (WPA, as it turns out) that had 16,000 memory blocks but could be scanned very quickly. At some point I looked at the gmail process with vmmap and noticed that the gmail process had a fair amount of memory (361,836 KiB) and a lot of separate blocks (49,719) coming from a single reservation in the Shareable category – a reservation with a size of 2,147,483,648 KiB, aka 2 TiB. Wot? I happened to know that the 2 TiB reservation is used for Control Flow Guard (CFG), and I remembered that “CFG” showed up on the call stacks where the gmail Chrome process was waiting – MiCommitVadCfgBits was on the stack. Maybe the large number of blocks in the CFG region were the problem! In hindsight it is obvious, but what if the CFG bitmap never gets cleaned up? What if memory gets allocated in the CFG bitmap when you allocate executable memory, but it doesn’t get freed when you free the executable memory. That would explain this behavior. That’s it. It’s super simple. And it was so satisfying when it worked. I ran it and then got my VirtualScan program to scan my VAllocStress process. I quickly got confirmation that the CFG block was horribly fragmented, and the scanning took a long time. And my VAllocStress program hung for the duration of the scan! At this point I had simulated the CFG fragmentation, the long scanning times, and the hang. Huzzah! The slow scanning of CFG memory is actually fixed in Windows 10 RS4 (April 2018 Update), which briefly had me wondering if all of this investigation was pointless. But it’s not. The CFG reservation starts out as just an address reservation – no memory is actually committed. As executable pages are allocated however parts of the CFG reservation are turned into committed memory, using real memory pages. And those pages never get freed. 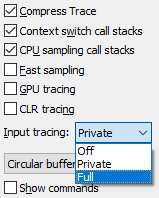 If you keep allocating and freeing randomly located blocks of executable memory then the CFG region will grow arbitrarily large! Well, that’s not quite true. The CFG memory block is best thought of a cache with bounded size. However that is little consolation when the bounded size is 2 TiB, per-process! The worst I’ve seen so far is when my gmail tab had been running for eight days and had accumulated 353.3 MiB of CFG memory, and 59.2 MiB of page-tables to map that memory, for a total waste of about 400 MiB. For some reason most people see either no symptoms or much milder symptoms than I do. It seems highly improbably that, as one of the most qualified people to diagnose this bug, I was the first to notice it. If any of the factors above had not been true then I would not have experienced this hang and the associated memory waste might never have been found. By the way, the reason that the hangs kept happening at 10:30 am is just because that’s when our IT team ran their inventory scans. 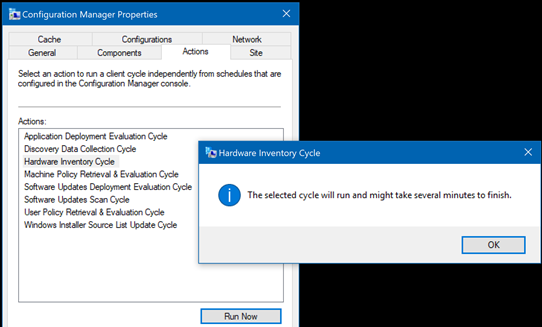 If you want to trigger a scan manually, you can go to Control Panel | Configuration Manager | Actions | Select ‘Hardware Inventory Cycle’ and then Run Now. If you want to play along at home you can grab the source-code to VAllocStress and VirtualScan from github, here. This investigation included a lot of rabbit holes. Some were important (page tables), some were instructive (locks), and some were purely a waste of time (WMI details). I’ll talk more about these, and a vmmap bug, in a follow-up post. If you want more gory details – some of which ended up being wrong or irrelevant – you can follow the whole investigation at crbug.com/870054. Hacker news discussion is here. Zombies probably won’t consume 32 GB of your memory like they did to me, but zombie processes do exist, and I can help you find them and make sure that developers fix them. Tool source link is at the bottom. My machine has 96 GB of RAM – lucky me – and when I don’t have any programs running I think it’s reasonable to hope that I’d have at least half of it available. The first clue came when I remembered that a coworker of mine had complained of zombie processes being left behind – processes that had shut down but not been cleaned up by the kernel. He’d even written a tool that would dump a list of zombie processes – their names and counts. His original complaint was of hundreds of zombies. I ran his tool and it showed 506,000 zombie processes! It occurred to me that one cause of zombie processes could be one process failing to close the handles to other processes. And the great thing about having a huge number of zombies is that they are harder to hide. So, I went to Task Manager’s Details tab, added the Handles column, and sorted by it. Voila. I immediately saw that CcmExec.exe (part of Microsoft’s System Management Server) had 508,000 handles open, which is both a lot and also amazingly close to my zombie count. The results were as dramatic as I could imagine. As I said earlier, the Windows kernel is well written and when a process is killed then all of its resources are freed. So, those 508,000 handles that were owned by CcmExec.exe were abruptly closed and my available memory went up by 32 GB! Mystery solved! Until this point we weren’t entirely sure what was causing these processes to hang around. In hindsight it’s obvious that these zombies were caused by a trivial user-space coding bug. The rule is that when you create a process you need to call CloseHandle on its process handle and its thread handle. If you don’t care about the process then you should close the handles immediately. If you do care – if you want to wait for the process to quit – WaitForSingleObject(hProcess, INFINITE); – or query its exit code – GetExitCodeProcess(hProcess, &exitCode); – then you need to remember to close the handles after that. Similarly, if you open an existing process with OpenProcess you need to close that handle when you are done. If the process that holds on to the handles is a system process then it will even continue holding those handles after you log out and log back in – another source of confusion during our investigation last year. So, a zombie process is a process that has shut down but is kept around because some other still-running process holds a handle to it. It’s okay for a process to do this briefly, but it is bad form to leave a handle unclosed for long. Where is that memory going? We can plainly see the ~16 GB drop in Process Private memory. 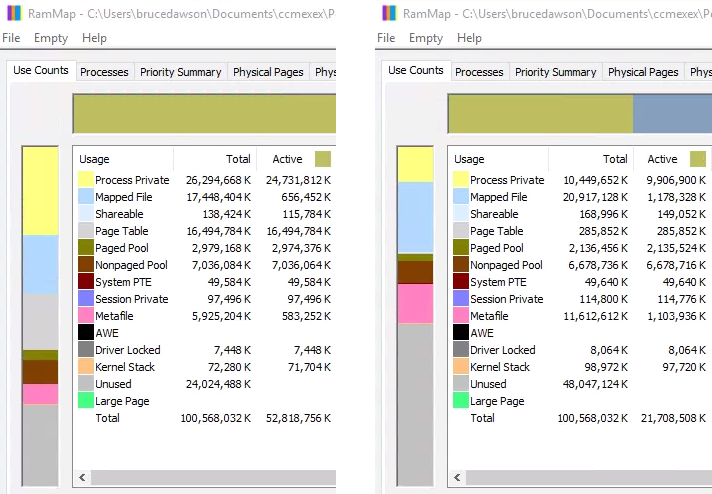 We can also see a 16 GB drop in Page Table memory. Apparently a zombie process consumes ~32 KB of page tables, in addition to its ~32 KB of process private memory, for a total cost of ~64 KB. I don’t know why zombie processes consume that much RAM, but it’s probably because there should never be enough of them for that to matter. A few types of memory actually increased after killing CcmExec.exe, mostly Mapped File and Metafile. I don’t know what that means but my guess would be that that indicates more data being cached, which would be a good thing. I don’t necessarily want memory to be unused, but I do want it to be available. I tweeted about my discovery and the investigation was picked up by another software developer and they reproed the bug using my ProcessCreateTests tool. They also passed the information to a developer at Microsoft who said it was a known issue that “happens when many processes are opened and closed very quickly”. Windows has a reputation for not handling process creation as well as Linux and this investigation, and one of my previous ones, suggest that that reputation is well earned. I hope that Microsoft fixes this bug – it’s sloppy. Why do I hit so many crazy problems? O(n^2) log-file creation in App Verifier – my next blog post? If you aren’t on a corporate managed machine then you probably don’t run CcmExec.exe and you will avoid this particular bug. And if you don’t build Chrome or something equivalent then you will probably avoid this bug. But! CcmExec is not the only program that leaks process handles. I have found many others leaking modest numbers of handles and there are certainly more. 274 zombies isn’t too bad, but it represents some bugs that should be fixed. The IntelCpHeciSvc.exe one is the worst, as it seems to leak a process handle every time I play a video from Windows Explorer. Visual Studio leaks handles to at least two processes and one of these is easy to reproduce. Just fire off a build and wait ~15 minutes for MSBuild.exe to go away. Or, if you “set MSBUILDDISABLENODEREUSE=1” then MSBuild.exe goes away immediately and every build leaks a process handle. Unfortunately some jerk at Microsoft fixed this bug the moment I reported it, and the fix may ship in VS 15.6, so you’ll have to act quickly to see this (and no, I don’t really think he’s a jerk). Process handles aren’t the only kind that can be leaked. 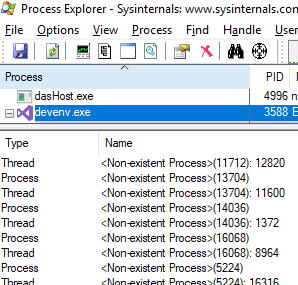 For instance, the “Intel(R) Online Connect Access service” (IntelTechnologyAccessService.exe) only uses 4 MB of RAM, but after 30 days of uptime had created 27,504 (!!!) handles. I diagnosed this leak using just Task Manager and reported it here. I also used the awesome !htrace command in windbg to get stacks for the CreateEventW calls from Intel’s code. Think they’ll fix this? 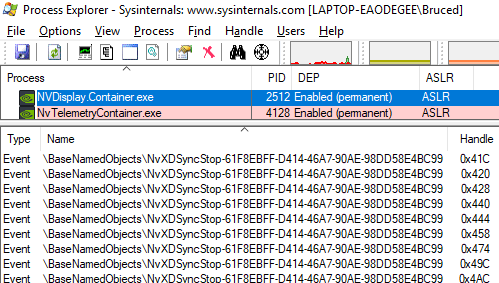 Using Processs Explorer I could see that NVDisplay.Container.exe from NVIDIA has ~5,000 handles to \BaseNamedObjects\NvXDSyncStop-61F8EBFF-D414-46A7-90AE-98DD58E4BC99 event, creating a new one about every two minutes? I guess they want to be really sure that they can stop NvXDSync? Reported, and a fix has been checked in. Apparently Corsair Link Service leaks ~15 token handles per second. Reported here. Apparently Adobe’s Creative Cloud leaks tens of thousands of handles – ~6,500 a day? Reported here. Apparently Razer Chroma SDK Service leaks a lot of handles – 150,000 per hour? Reported here. Apparently ETDCtrl.exe (11.x), some app associated with ELANTech/Synaptics trackpads, leaks handles to shared memory. The process accumulated about 16,000 handles and when the process was killed about 3 GB of missing RAM was returned to the system – quite noticeable on an 8 GB laptop with no swap. Apparently nobody has been paying attention to this for a while – hey Microsoft, maybe start watching for handle leaks so that Windows runs better? And Intel and NVIDIA? Take a look at your code. I’ll be watching you. So, grab FindZombieHandles, run it on your machine, and report or fix what you find, and use Task Manager and Process Explorer as well. Twitter announcement is here, Hacker News discussion is here, reddit discussion is here. Updates: Microsoft recommended disabling the feature that leaks handles and doing so has resolved the issue for me (and they are fixing the leaks). It’s an expensive feature and it turns out we were ignoring the data anyway! Also, all Windows 10 PIDs are multiples of four which explains why ~500,000 zombies led to PIDs in the 2,000,000+ range.